“We do good without being poseurs and filosophy without being jerks” Pericles, well more or less, Epitaph. Since November 2009 supporting the local and international rioters community with knowledge and culture for a vandalistic use. The material found here were gathered and uploaded with the care of a very few persons -by the words of that local Thessaloniki district attorney- “deranged, that divert themselves to unlowful destructive activity” that seek to share it with others alike, in the services of self-consciousness and evolution of this semi-visible (post Decembrian) human community that bears within it a practical critique of the capitalist civilization and the practical theory for its surpass. 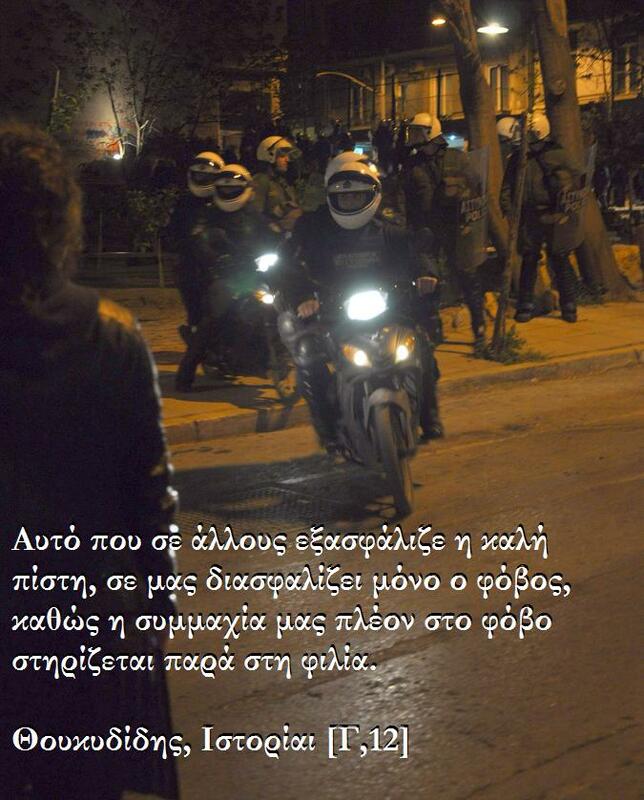 On the case of our jailed friends Polys Georgiades and Vaggelis C.
“Revolutionary Struggle” armed group live-TV arrests, terror-spectacle and brutal crackdown on peaceful community resistance. What’s happening at the moment, is the Greek state evolving its own strategy of tension, trying on the one hand to disorientate and construct a scapegoat, in the face of its own economic and political bankruptcy and the pillaging of economic and social gains from past struggles of its subjects, through which it hopes(?) to overcome it. A pillaging, that its own impotent and already “burnt” “little parrots” are not able to guarantee the much needed consensus, and thus it could’nt be put in any other way than as obedience to the imposition of external and higher mechanisms, such as the IMF and the EU. The sunken prestige of Greek democracy and its -neighbourhood mobster-like- bourgeoisie (setting the paradigm: “don’t mess with us” and its primitive methodology: violence and public humiliation) makes a desperate effort to get up on its knees again, by showin off military power against its most demonised enemy: the anarchists. At the same time, they are trying to put the latter one step aback, nailed in defense, maybe even hoping for some of them to engage in a military type of vendetta, already lost from the start, but mainly to paralyze radical critique, the practical critique of the streets – where our Class meets. Final Updates on the trial of Polykarpos Georgiadis, Vaggelis Chrysohoidis and Giorgos Haralambidis (Court of Appeals).